Although eggs are one of the most commonly used foods in the kitchen, they are useful for more than just baking and cooking. Since the 1940s or earlier, women have made egg hair treatment mixes as well as selected shampoos that contain eggs. In fact, an egg yolk hair mask can be one of the most effective hair treatments. The yolk will work to condition your hair and you can use them as often as you want. The yolk is especially helpful for dry, damaged hair and when used alone or with other ingredients, the treatment will give you shiny, strong, and healthy hair. Hair is mostly made up of proteins and amino acids, and this combination means that egg yolk for hair is the perfect method of boosting the hair’s supply of necessary nutrients. Eggs contain a large amount of protein as well as fatty acids and vitamins to strengthen hair. They deliver the correct nutrients so your hair can optimize its health. The vitamin A found in egg yolk will improve the hair’s ability to produce natural moisture by stimulating sebum production. This increased sebum production lets vitamin A control dandruff and prevent drying of the scalp, improving hair growth while preventing hair loss at the same time. Vitamin E works to promote healthy hair by offering protection from environmental factors such as UV rays that could otherwise cause damage to your locks. 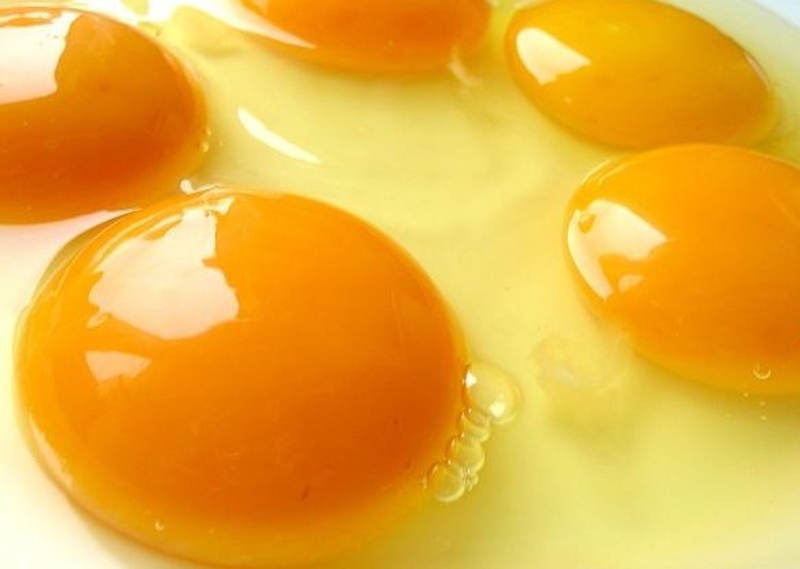 The vitamin D in egg yolks improves the texture and luster of your hair. The fatty protein lecithin helps reduce frizz in your hair and also prevents breakage and brittleness. Biotin is also present in egg yolks and works to renew hair roots and follicles, improving the hair’s overall health. You may be wondering how you can use egg yolk for hair. In reality, there are several simple and effective methods listed below. Egg yolk will seep right into your scalp and hair follicles, making it a great option for adding moisture. Determine the quantity of egg yolk based on your hair length and thickness. Thoroughly beat the egg yolk. Mix honey and olive oil with the egg yolk, as well as the optional yogurt. Apply the egg yolk for hair mixture onto your scalp and hair, massaging it in. Leave the mixture for an hour and a half. Wash it off using cool water. This method of using egg yolks is incredibly simple, but still effective. It helps prevent hair loss for those who have this issue. Take the eggs and beat them so you get a creamy mixture. Take the mixture, applying it to your hair and scalp. The nutrients found in egg yolk help make it a great option for a conditioner. Best of all, making your own conditioner is easy and inexpensive, using items you probably already have at home. Carefully mix together the egg yolk and avocado, combining enough of each ingredient to cover your head with the mixture. Apply the resulting mixture on your scalp and hair evenly. Let the egg yolk and avocado mixture stay on your head for between fifteen and twenty minutes. Use cool water to wash off the egg yolk. If your coconut oil is solid, then first warm it up on low heat so it melts and become liquid. Take your liquid (and at least slightly cooled) coconut oil and mix it with the honey, whisking the two ingredients together. You may need to whisk for up to two minutes for the ingredients to correctly combine. Separate your egg yolk from the white using a bowl. Take your egg yolk or hair and gently whisk it in its own bowl. After whisking, slowly add your mixture of honey and coconut oil. Once again whisk this mixture until all ingredients are combined. Make sure your hair is dry and apply the mixture, massaging it into both your hair and scalp. You will find it much easier to ask someone to massage the mixture into your hair for you as they will be able to cover your entire scalp, including areas you can’t see. As a bonus, you will get to enjoy a scalp massage. Take a shower cap and cover your hair. Aim to leave the egg yolk mixture in your hair overnight or at least as long as you are able. Try to squish your hair through your shower cap every once in a while. If you do sleep with the mixture overnight, use an old towel to cover your pillow in case of leakage. Wash the mixture out using warm water until it is all gone. Avoid shampooing if possible, but if your hair feels oily, use a gentle shampoo. Dry your hair, styling it like normal. Don’t leave hair mask on for an extended period of time. This may make it harder (or impossible) to remove. Always wash and/or rinse your hair thoroughly after using egg yolk for hair. Don’t use egg yolk for hair if you are allergic to any ingredients in the treatment. Be sure to watch for allergic reactions afterwards (symptoms including difficulty breathing, skin rashes, or swelling on the tongue and lips). The mixture may drip or spatter, so wear old clothes when applying your egg yolk treatment.